Eastern Rock Lobster have a green body and brownish-orange legs. Their abdominal segments are smooth and unsculptured on their dorsal surface. They generally move into deeper water in early winter, and return closer to the shoreline in late August. Maximum weight of 8 kg and a carapace length of 26 cm (1 m including the antennas). Eastern Rock Lobsters inhabit the continental shelf along the east coast of Australia, from Tweed Heads in New South Wales, around Tasmania, through to Port MacDonnell in South Australia. They hide in holes and crevices around rocky areas and reefs, preferring vegetative cover such as weed/kelp. In the south of the state the Southern Rock Lobster (Jasus edwardsii) is found. Eastern Rock Lobsters are green in colour, Southern Lobsters are red. In the north of the state the Ornate Rock Lobster (Panulirus ornatus) occurs. 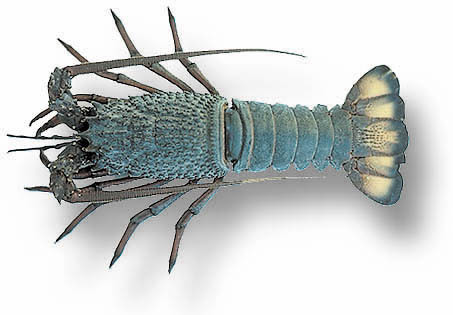 Ornate Lobsters are greenish blue to reddish brown in colour, with orange spines on the head.